Inspired by the Caroline, the Caroline Parkway vanity offers a clean sleek structure with abundant storage. The vanity is constructed from quality solid oak wood and finished in classic espresso color. The Caroline Parkway also features an Italian Carrera white marble countertop and a matching backsplash. 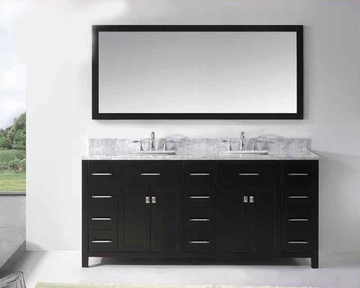 This vanity will be a great striking centerpiece to any bathroom design.Virtu USA has taken the initiative by changing the vanity industry and adding soft closing doors and drawers to their entire product line. By doing so, it will give their customers benefits ranging from safety, health, and the vanity’s reliability.